Desert Academy, Santa Fe, USA "I've got to say, I'm really happy with ApplianSys and with CACHEBOX. It's not just the fact the solution works well..."
Shawn Organ, Network and Information Systems Administrator, Long Beach Unified School District, USA "CACHEBOX is a robust product that is well tested and has been tailored to cater to Service Providers like us." Copper River School District (CRSD) is based in Glennallen, a lightly populated community in the east of Alaska, USA. It runs three schools, from elementary age up to K-12, and supports home education via its Upstream Learning program. CRSD recently adopted a 1:1 e-Learning program, whereby each student and teacher has been equipped with an internet-connected device to access educational resources and video content. However, these devices were frequently maxing out the district’s internet connection. At the start of a lesson, students would all log on to the same sites and request the same content – causing a significant spike in traffic. YouTube videos would also constantly buffer. Interactive content would be slow to respond. Even static web pages would take noticeably longer to load. Bandwidth was also being eaten up by software updates. When each device connected to the network in the morning, it would check for new updates and download them in the background. This was saturating the network, slowing down access to other internet resources and negatively impacting student learning and engagement. “Students and teachers wanted to use video and educational websites for 1:1 e-Learning – but their internet connection was always maxing out,” said Chris Van Wyhe, Technology Co-ordinator. 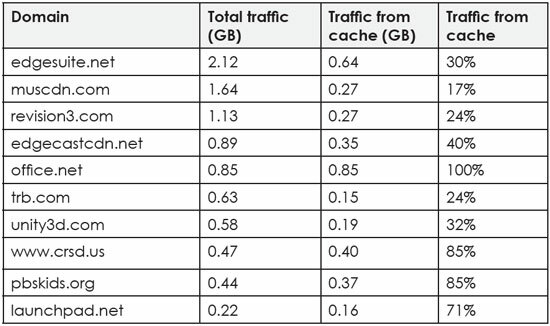 So, they turned to an alternative and more sustainable solution: web caching. While exploring different products and vendors, CSRD spoke to ApplianSys and viewed an online demonstration of CACHEBOX. The team looked at its specific design features for education, and examined real-world data that showed how schools have achieved faster internet access in the classroom while reducing bandwidth consumption on software updates and e-Learning content. Excited by the potential, CRSD was keen to understand how CACHEBOX could be deployed across their Wide Area Network. This comprises a 100Mbps internet link coming into their main school site at Glennallen, feeding a 50Mbps MPLS connection to Kenny Lake School and a 20Mbps MPLS connection to Slana School. Given the high cost as well as the lack of local infrastructure to support an upgrade of their bandwidth, CRSD chose a ‘distributed deployment’ to maximise the benefit of caching at each school. They ordered one CACHEBOX210 for their main school site at Glennallen and two CACHEBOX130 models for the smaller sites at Kenny Lake and Slana. Since deployment, the district has reported exceptional increases in internet speed. On average, all content is loading three times faster than before. But certain educational sites, such as videos.revision3.com, are loading over 48 times as fast – making a huge difference to student engagement. Because CACHEBOX delivers repeat internet requests by serving that same content locally, it can be delivered at local area network (LAN) speeds. On average, CRSD has seen more than 50% of its web requests being served from CACHEBOX. That means half its bandwidth is being freed up for other internet traffic, without the need for a costly connection upgrade. The chart below shows the performance of popular education content domains. Caching has been particularly effective for software updates, as shown in the chart below. By removing large operating system, anti-virus and application update files from the internet connection and delivering them via the school’s LAN, they cause less network congestion and are applied to devices far quicker. as a trusted intermediary on the network so it can cache secure HTTPS content. Education materials published by the likes of Pearson and Rosetta Stone are often delivered via HTTPS. If that content has suitable cache headers, CACHEBOX will know which objects it can store and re-use, and which must pass through without being cached. Support for HTTPS caching will further increase the amount of traffic that can be cached, freeing more bandwidth and delivering even more content at higher speeds. “We’re getting great results! I can see exactly how much bandwidth we’re saving across different domains. Most importantly, students are noticing a real difference in the classroom,” says Chris.